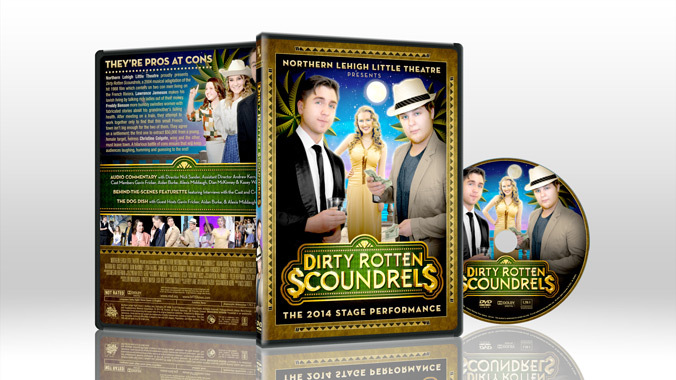 Using a multiple-camera setup, Kernie Cam Productions produced a DVD edition for Northern Lehigh Little Theatre's Spring 2014 production of the musical comedy, "Dirty Rotten Scoundrels." Featuring custom opening and end title graphics, the show was edited in Adobe Premiere CS6, utilizing nine different camera angles to capture the best angles and performances from the student performers. Released shortly after the show's theatrical run, the DVD includes the full theatrical experience, along with a full-length audio commentary, behind-the-scenes featurette, special episodes of The Dog Dish hosted by the members of the cast, scene selection capability and interactive menus. Below is the complete list of bonus content for the DVD release of "And Then There Were None." The Dog Dish: 3 Episodes of Northern Lehigh High School's morning news show guest-hosted by Gavin Fricker, Aidan Burke, and Alexis Middaugh.